Spray a large slow cooker with nonstick baking spray. In a large bowl, whisk together the cake mix, eggs, water, and melted butter. Fold in the chocolate chips, then spoon the batter into your prepared slow cooker. Place spoonfuls of Betty Crocker™ Frosting all over the top of the cake batter. Use a knife to swirl the frosting into the batter. Cover the slow cooker and allow to cook for 3-4 hours on high heat. Because slow cooker baking times will vary, start checking your cake every half hour at about the 2 1/2 hours mark to see if it's cooked thorough. The center and edges should bounce back lightly, but there may be a thin, gooey layer across the cake because of the lava frosting. Spoon warm cake into serving bowls. Top with whipped cream or ice cream, if desired. Serve and enjoy! Be they called Crock Pots or slow cookers at your house, there's no end to the delight this snazzy kitchen appliances can bring into one autumn day. You can toss together a roast. Pull together some pulled pork Or you can forget the whole "responsible dinner making" gig and just head straight to dessert. Yeppers. 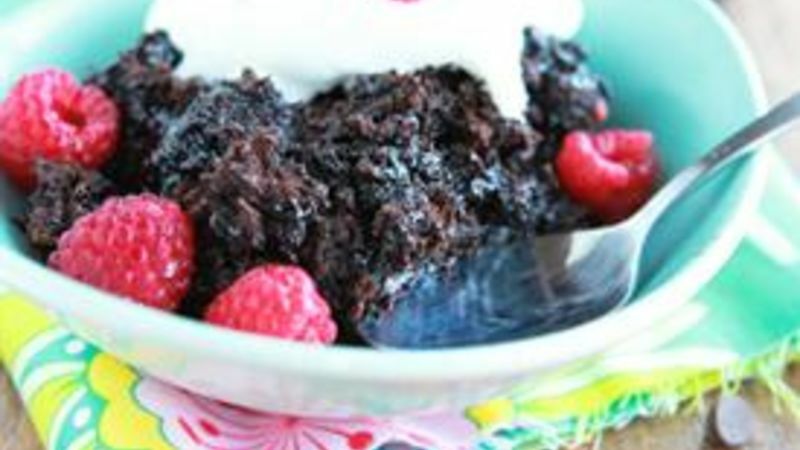 You can so make a cake -- an actual, real-live, lavalicious cake in your slow cooker. And it's crazy easy, too. Wanna see how easy? Just scroll on down for our photo tutorial. Yeah. We love you that much. Mix together a Betty Crocker Chocolate Cake mix, toss it into your slow cooker, then grab a can of Betty Crocker chocolate frosting. Spoon giant mounds of frosting all over the top of the cake batter. Make sure you get the edges! We need to ensure proper lava-liciousness all over the cake. Use a knife or spatula to swirl the frosting and batter together. Just scoop the top layer of the batter up gently and swirl swirl swirl! Cover and cook that baby on high for about 2-3 hours. Time will vary slightly depending on your slow cooker, but you'll know it's done because the edges will spring back when touched lightly with a finger, and the center will be gooey but not batter-like. Now for the best part, nab yourself a spoon and scoop a giant heap of the cake right onto your plate. Just scoop it like it's 1999, then party it up with a spoon. Feeling feisty? A dollop of whipped cream or ice cream up top will finish off your cake like a diamond collar on a kitty cat. Meow. What's your fave slow cooker recipe in the fall? Share with us below!